In one of the most profound developments in the central bank gold market for a long time, the Hungarian National Bank, Hungary’s central bank, has just announced a 10 fold jump in its monetary gold holdings. The central bank, known as Magyar Nemzeti Bank (MNB) in Hungarian, made the announcement in Budapest, Hungary’s capital. Before this month, Hungary’s central bank held 3.10 tonnes of gold. This gold purchase raised the central bank’s gold holdings from 3.1 tonnes to 31.5 tonnes, i.e. a 1000% or 10-fold increase. The 28.4 tonnes of gold was purchased in ‘physical form’, and ‘its repatriation has already taken place‘ to Hungary. “Budapest, October 16, 2018 – In view of the long-term national and economic strategy goals, the Monetary Council of the National Bank of Hungary has decided to increase the gold reserves of the country. As a result, in October 2018 the Bank’s precious metal holdings were raised from the previous 3.10 tonnes to 31.5 tonnes, a tenfold increase. Following the substantial increase in the Bank’s gold reserves in physical form, its repatriation has already taken place. The possession of precious metal within the country is in line with international trends, supports financial stability and strengthens market confidence in Hungary. With current holdings of 31.5 tonnes gold reserves, valued at approximately $ 1.24 billion, this size of holdings approaches the historical level that was held by our country at the time of the “golden train”. Within the overall international reserves of the Bank, the share of gold reserves has now risen to 4.4%, which corresponds to the average of non-euro area Central and Eastern European countries. The role of gold reserves in the nation and in the nation’s economy strategy is becoming more and more appreciated while both the possession and the increase of nations’ precious metals holdings appears to be decisive international trends. At the end of World War II, Hungary received some 30 tonnes of gold bars and gold coins on the MNB’s legendary “gold train” in the Spital am Pyhrn in Austria. This amount was fully returned to the country after the war while providing cover for the introduction of the new currency of the country, the Forint, thus supporting financial consolidation and the stabilization of the post-war Hungarian economy. At the end of the eighties, Hungary’s gold reserves, driven by short-term investment objectives, fluctuated between 40 and 50 tons and then, at the time of the change of regime (between 1989 and 1992), the ruling central bank executives decided to reduce to a minimum level of about 3.1 tons, which was the level at the end of September 2018. Gold is still considered to be one of the world’s safest assets, whose characteristics can be attributed to gold’s unique properties such as finite supply of physical gold, and lack of credit and counterparty risk given that gold is not a claim against a specific partner or country. Note that Hungary is a member of the European Union (EU), and therefore the Hungarian National Bank is a member of the European System of Central Banks (ESCB). However, as Hungary is not a member of the Eurozone and does not use the Euro, the Hungarian National Bank is not a member central bank of the European Central Bank (ECB). With Hungary recently under attack from the European Parliament in September, the timing of this new gold purchase by Hungary’s central bank in early October is very interesting, to say the least. With almost all of Poland’s gold held at the Bank of England, a relevant question now is how long before Poland also sees fit to repatriate its gold in physical form away from the fractionally-backed LBMA controlled gold trading centre of London. 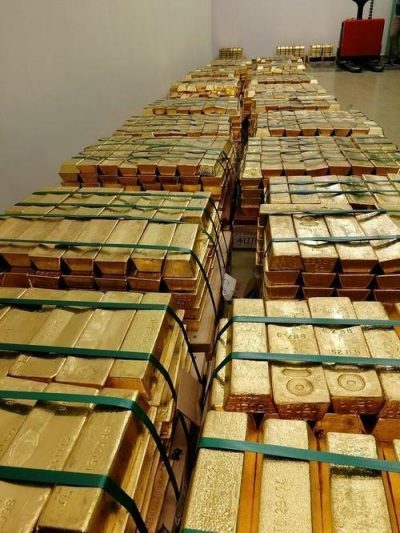 Another of Hungary’s close neighbors, Austria, has itself spent the last 3 years repatriating 140 tonnes of its gold from the Bank of England in London and has nearly completed this repatriation operation now. Add to this the high-profile Germany Bundesbank gold repatriation program in recent years, and a similar gold repatriation exercise from the Netherlands central bank, and the trend is clear: central banks in Europe have been flocking to shore up their international reserves with gold, because, as in the words of the Hungarian central bank “Gold is still considered to be one of the world’s safest assets”.